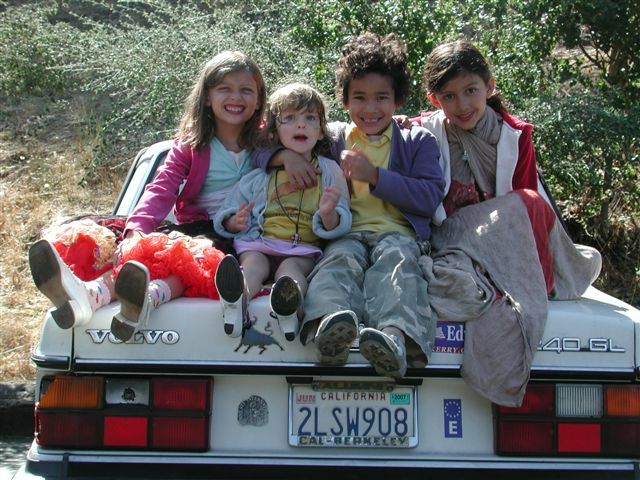 On the Volvo, left to right, are Niko, Rhona, Amir and Lulu. These are kids who lived with me and my family at U.C. Berkeley’s student family housing complex, which we knew as Section B in U.C. Village, or more fondly, simply as The Courtyard, circa 1999-2003. The Courtyard held two dozen families from around the world, all at Cal to do graduate work. Our small apartments faced an enclosed courtyard with two grassy circles, cluttered with toys and climbing structures. Everyone had children. The children played all day and into the night. We adults adjusted to our cramped homes and learned to spend more time outside, embracing the communal. We spent most weekends sitting on folding chairs on the green, ignoring our chores, pondering life, watching our kids chase each other, holding each other’s babies. We were from every state and nation. The potlucks were the stuff of legends. The University tore down the Courtyard sometime in 2004 or ’05 to make way for “nicer” student family digs. Read: More expensive. Our community had largely moved on anyway, graduating and scattering to the four winds. But we’ve all managed to keep in loose touch, no matter where we are: Los Angeles, New York, Portland, Utah, China, Singapore, Egypt and Australia. We’ve been closer, lately, on the news that beautiful, soulful Amir, aged 9, has crossed the river. The extremely upsetting details are here. Amir was a beautiful fourth-grader in Berkeley. Long, dark curls. Honey skin. impish smile. And the saddest, oldest eyes you’ve ever seen on a child. I remember him most running around with the other small boys in his Buzz LightYear costume, wielding his Star Wars-issue light saber mightily. For about a year there, all we had were princesses or super heroes. His mother was a student at Cal. A young, single mom, living there with us in the Courtyard. She was very smart, perhaps too smart. And her demons were very bad. She loved her son, though. She took good care of him; kept him warm and well-fed. She called him “Mister,” or “sweetpea.” Stafford Gregoire, an English Professor who also lived in the Courtyard and knew Amir, writes about him on his blog, here. Mental illness is outside the purview of this blog. Instead, I wanted to honor Amir, who was gluten intolerant, by hipping you to a very good, very popular blog, Gluten-Free Girl. Check it out for some A-1 recipes that don’t include wheat gluten. I’m just home from New England. I’m going to make my children something to eat for dinner and some honey tea. Please do the same for someone you love. Bye, Mister. We’ll see you again. Amir sounds like a very special boy – – my heart just aches as I read your post. Cyber hugs to you! Julie, That made me cry all over again. I posted about Amir again today, because Chandler seems to be writing dry-erase letters to him regularly. Mason is amazed that she lets me post them on the blog. Tomorrow, or soon, my post will be a recipe. We all miss all of you and Cha-Cha is planning for Annie and Jack’s visit to our new house. We are getting excited about. Previous post: Do you tofu?